When Is A Physician Too Old To Practice? There are about a quarter of a million physicians who are currently 65 or older and in practice. This represents about a quarter of those currently practicing. Unlike other professions like federal judges, FBI employees, and nuclear materials couriers, there is no mandatory retirement age for doctors. 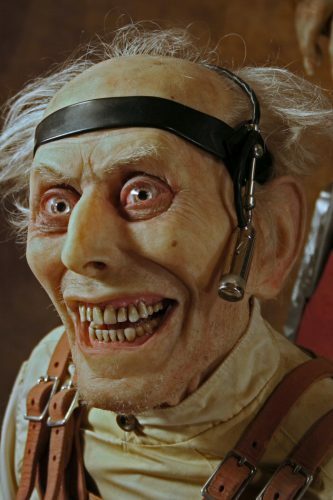 Although not forced to retire, commercial pilots are more closely monitored after they turn 65. But our profession has not really done a very good job of policing itself. It relies on voluntary action to identify struggling colleagues, who are generally reluctant to report a partner. Ages ranged from 30-80 years. 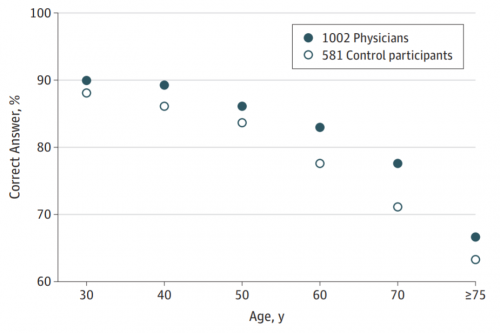 Note that the physician scores were consistently higher than the controls for all age groups, but declined significantly with age just like the controls. The big problem is that individuals have difficult recognizing (or accepting) their own cognitive decline. The American College of Surgeons (ACS) assembled a workgroup to address this issue. They recommended that surgeons undergo voluntary, confidential testing of their baseline vision and physical examination starting at age 65-70, with regular re-evaluation afterwards. So far, only 3 or the more than 5,000 hospitals in the US do this. Canada has a mandatory age of 70 for commencing regular peer evaluations of competence. Obviously, the US does not. There are really two components at play: wellness (which includes cognition) and competence. The problem is the neither correlates well with chronological age, but rather physiologic age. And the latter is impossible to quantify. So what do we do? This is a problem that can’t be ignored from a patient safety standpoint. But it does not readily lend itself to simple pronouncements of a mandatory retirement age. There are many physicians who can and do provide excellent service to their patients well past the customary retirement age. They are able to apply a lifetime of lessons learned that their younger colleagues simply do not have. We need uniform adoption of mandatory, not voluntary, testing of wellness and competence. Individual hospitals need to heed the recommendations of national organizations like the ACS to implement these mandatory programs to ensure fairness and avoid the specter of age discrimination lawsuits. I’m no spring chicken anymore, and I think about this every time I find myself searching for the name of that weird retractor I need. How old is too old? What do you think? Reference: The Aging Physician and the Medical Profession. JAMA Surgery 152(10):967-971, 2017. Previous PostACS Trauma Abstract #6: Scanning Unstable Trauma Patients?? ?Next PostTrauma Team Activation: What’s It Like For Your Patient?